Do you know that a simple post by any of your employees on social media could shatter your brand’s social image? It can result in the downfall of your business, ruin your reputation and tear apart whatever you had built. Scary isn’t it? But you can prevent potential issues with a social media policy. Since its establishment, social media has been one of the key reasons behind the success of many businesses (small and large). It revolutionized the entire Internet marketing industry and made the World Wide Web a commercial pool of opportunities. But it can also land your business in trouble within seconds. Social Media is an independent platform for communication where anyone can share anything publicly. The important words in the above definition are “anyone” and “anything”. To be more precise, let’s replace the word “anyone” with “your employees” and the word “anything” with “inappropriate content”. Now read the sentence from your brand’s standpoint. Can you see the potential dangers? It’s a platform of communication where your employees can share inappropriate content publicly. Any inappropriate content published by an employee working under you can bring negative reputation or consequences to your business. All businesses are prone to such issues. Content such as abuse, discrimination, bullying and the sharing of confidential information from your company should be strictly prohibited. To somewhat control your employee’s social media activities, you should establish social media policy guidelines. These guidelines can strengthen the security of your business. How Can Social Media Policy Make Your Business Secure? Let’s take a look at the significance of a policy and the pivotal role it can play in making your business secure online. 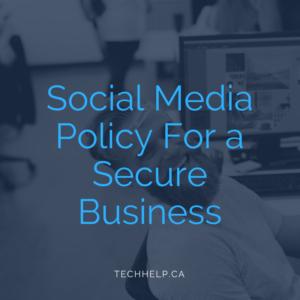 A policy can help you cover most of the problems arising from social media and secure your business from potential dangers. State your intent clearly through this policy. Specify that the guidelines for online communications mentioned in your policy have to be strictly followed by each and every employee. Most company policies state what their employees are NOT supposed to do on the Internet. Take the opposite route instead and let your employees know what they can freely do on the Internet. You should specify how they could use social media effectively as a tool for business growth. A positive approach is often better than a negative approach. Every social media policy should specify the consequences for not adhering to the guidelines. Let your employees know that strict disciplinary measures will be taken against them if they’re found publishing anything online that hurts the company’s reputation. The guidelines of your policy must include the legal portion, which needs to be followed by everyone. Copyright infringement, the disclosure of confidential information and other potential legal issues must be addressed in your company policy. This way, any legal trouble caused due to an employee publishing inappropriate content can be sorted out with your policy. Let’s quickly take a look at a company that has a strong policy. They mention that their employees must take responsibility for any inappropriate action. Coca-Cola also points out in their policy that sound judgment and common sense should be applied when posting on the Internet. They also state that they’ll “reasonably monitor” the online activities of their employees, set up some appropriate protocols and keep records of the activities for legal reasons. Many small businesses tend to ignore or neglect the creation of a social media policy. After reading about its significance today, you should probably create one to secure your business too.